If you're curious about card games, or you're planning a party, then you need Cards Against Humanity in your life. Right now, Amazon is selling it for 25% less in the UK, making it £18.75, which is the cheapest it has been since it launched back in 2011. The basic premise, for anyone who doesn't know, is that players are dealt a hand of cards with 'Answers' on them, which are played anonymously to reply to question / scenario cards. The funniest answer to each 'question' is the one that wins the hand. It doesn't sound all that until you actually play, when things get decidedly smutty, and increasingly dark as everyone warms up and plays increasingly nastier answers. If you share a dark sense of humour with friends, it's one of the best board games (well, card game) you can play with them. This offer is on the UK version, so you'll understand all the jokes and references. 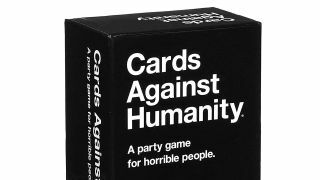 There are dozens of expansions available for Cards Against Humanity, and some of these are on sale via Amazon today, as part of the Amazon Spring Sale. We're keeping an eye out for more board games, as they're super popular in 2019 and they appeal to the same kind of sensibilities as console and PC games. The deal runs for TODAY ONLY so make sure you snap up Cards Against Humanity while you can, if you think you can handle it.